Prioritization is about focus—where to assign resources and when to start the work. It is not about scoring methods and ranking mechanisms. Without defining project priorities, it is difficult to effectively distribute personnel to carry out the highest valued projects. Project priorities enable management to assign their employees to the most important projects. Gaylord Wahl of Point B says that priorities create a ‘true north’ which establishes a common understanding of what is important1. Prioritizing projects enables organizations to make the best use of company resources. Without a clear and shared picture of what matters most, lower-value projects can move forward at the expense of high-value projects. Again, prioritization is about focus—WHERE to assign resources and WHEN to start the work. Prioritization and resource allocation go hand in hand. 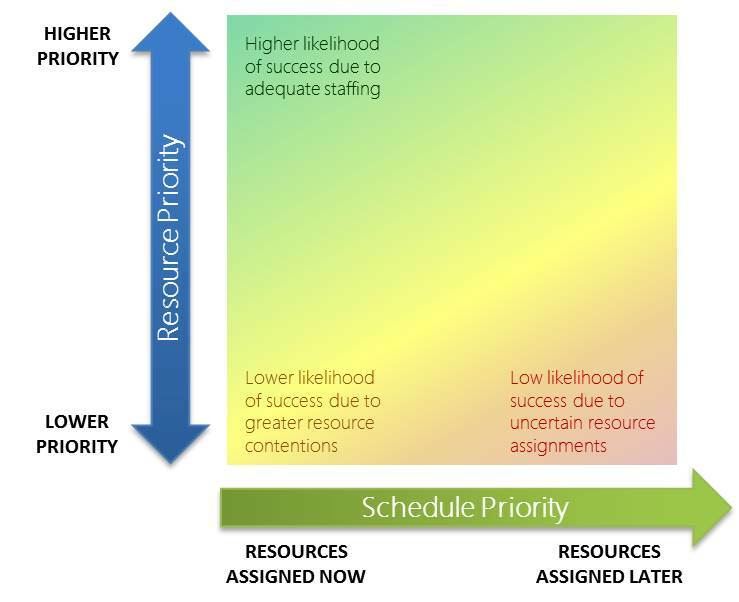 In the diagram above we see that prioritization relates to resource priority and schedule priority. Resource priority drives the question, “where are we going to invest our resources now?” The fundamental resources are money and people. Since there is often more work to be done than there are resources available, senior leadership needs to provide guidance of where to investment money and where to allocate human resources. This requires an understanding of how to get the most important work done within existing capacity constraints. However, not all projects can be initiated immediately. Prioritization can also help direct the timing and sequencing of projects. In some cases, high priority projects may have other dependencies or resource constraints that require a start date in the future. In other cases, lower priority projects get pushed out into the future. In both cases, schedule priority helps answer the question “when can we start project work?” Having the right human resources available to do project work is a critical success factor. High priority projects have a higher likelihood of success due to adequate staffing. Lower priority projects may face more resource contention and have a higher risk of project delays due to inadequate resource time. Lower priority projects that get pushed out into the future have an even lower likelihood of success since these projects face challenges around project initiation and higher resource contention. The purpose of prioritization is to allocate resources to the most important work. Prioritization provides focus—WHERE to assign resources and WHEN to start the work. The goal of prioritization is to accomplish the most important work to deliver maximum business value. Although prioritization is a critical need in many organizations, in the next post we will highlight cases where prioritization is a waste of time. This entry was posted in CIO, Digital Transformation, IT Portfolio Management, PMO, PMO as a Service, Project Portfolio Management, Resource Management, Technology Business Management and tagged CIO, Cloudbyz PPM, Project Management, Project Portfolio Management, Resource Management. Bookmark the permalink.